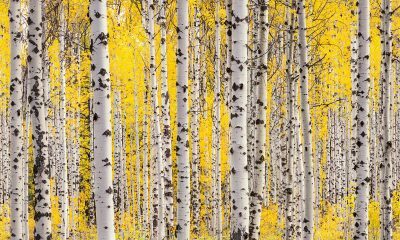 This beautiful fine art photograph of the Three Sisters Wilderness Area has long been one of my best selling prints because….it’s really beautiful! This Three Sisters Wilderness photo was captured at sunrise from the summit of South Sister, the tallest of the Three Sisters. On special mornings,the first light of morning casts a warm pink glow known as “alpenglow” upon the Three Sisters Mountains. It is a stunning effect that requires clear atmospheric conditions to the east. I had visualized this photograph years before while climbing South Sister. The climb up South Sister is long and hard but not terribly technical. Gaining nearly 5,000 vertical feet , much of it over loose pumice and topping out at 10,358 feet. I’d seen good photographs from the summit of South Sister but not great ones. South Sister is one of the most climbed glaciated mountains in the world and it offers spectacular views. Ini order to appropriately honor South Sister and her views, I knew I needed to be on the summit prior to sunrise which occurred at about 5:25AM on the morning I captured this image. During my first attempt to capture this Image, I left my home in Bend at 11:00 PM, drove to the trail head and climbed all night, in the pitch black, only for heavy clouds to blow in and engulf me in a dense shroud. I returned home dejected but not defeated. Climbing at night with my 45lbs of camera gear was tiring and extremely slow. On my next trip, I enlisted the help of My good friend, Jake “Squishy” Bell. We left Bend the evening before. Weather conditions called for clear skies the next morning. As we climbed, we were blasted by winds which pushed from side to side on the climbing trail. We found an an alpine wind block, pitched our tent and bedded down for the night. I arose at about 4:30AM the next morning to find beautiful light to the east and absolutely nuclear winds. All of my fine art landscape photographs are captured with a large format 4×5 film camera. My 4×5 camera helps me to create huge prints with exceptional detail. Because my 4×5 requires longer exposures than digital cameras, I use a tripod for all of the scenes I compose and all of the images I capture. I often struggle in windy conditions because the leather bellows on my 4×5 camera act as a sail, jostling my camera about, making sharp images impossible. On this hurricane like morning, Squishy and I couldn’t even walk in a straight line without being being buffeted side to side. I returned to the spot I’d selected to compose my image, unpacked my camera backpack, placed my tripod and it immediately blew over. I replaced it and it blew over again. This was all before I even set attached my giant wind sock of a camera to the tripod. The conditions were way too windy for any kind of high quality photographs. It was a shame as we ere periodically engulfed in clouds burning with pink alpenglow. The experience was surreal, beautiful and frustrating. 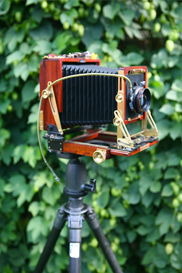 I never made a single exposure with my 4×5 camera. Three Sisters Wilderness Area, Success! The next year, the Cascade Lakes highway opened early, while there was still good snow in the Three Sisters Wilderness Area. 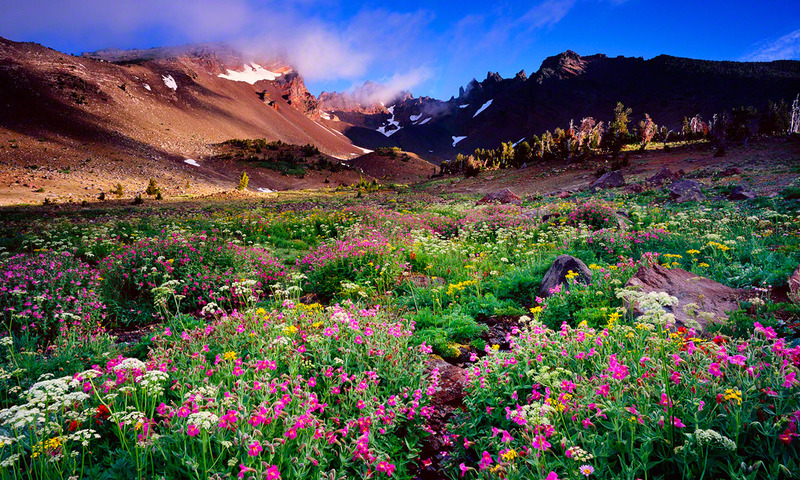 I renewed my efforts to capture this iconic, fine art photograph of the Oregon Cascades. I recruited another friend to serve as a sherpa and we climbed South Sister as I had with Squishy but this time without the wind. I awoke the next morning to epic conditions. Clear, windless skies and view as far as the eye could see! Landscape photography heaven! 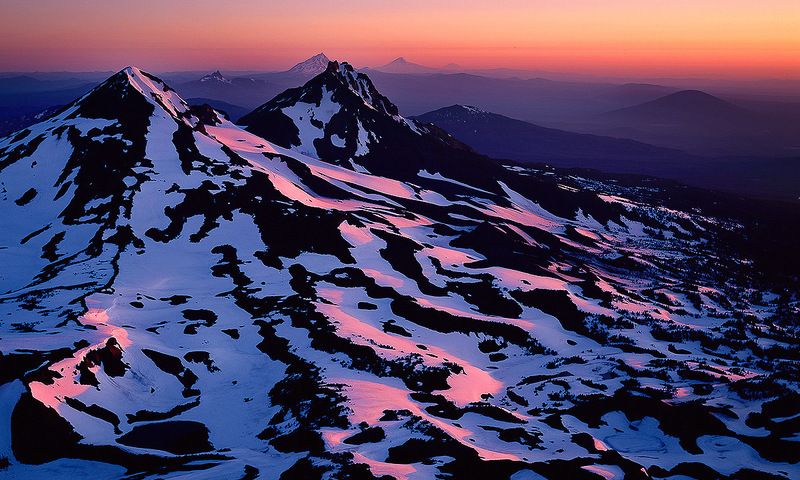 Eventually the sun began to rise, awakening the Oregon Cascades with warm alpenglow. 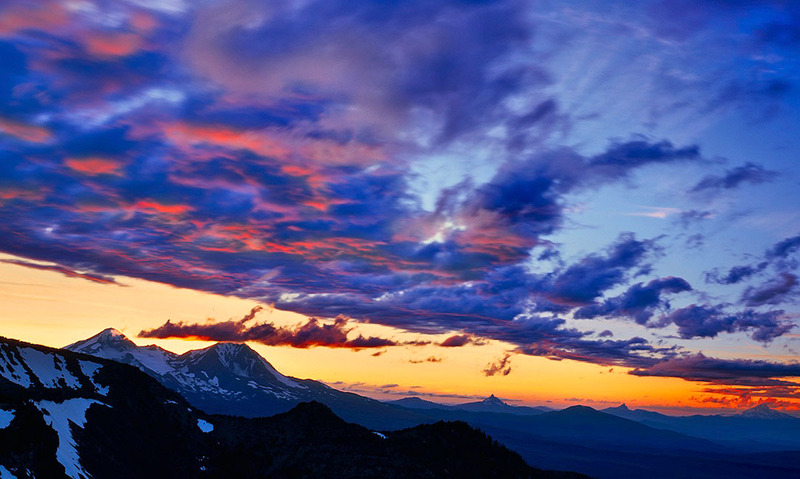 I composed and captured this beautiful image which I later titled, “Summit Sunrise” In the larger prints of this gorgeous image, You can see, Middle Sister, North Sister, Three Fingered Jack , Mt. Jefferson , Black Butte, Mt. Hood, Mt. St. Helens, and Mt. Rainier! In the opposite direction, I could see Mt. Shasta, in California! 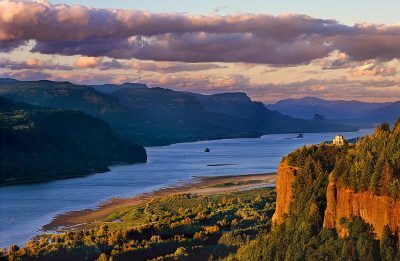 What an amazing morning and the perfect reward for all of my efforts to capture this beautiful photograph of Oregon’s Three Sisters Wilderness Area!